Are you looking for a sign that has a high tolerance to cold and hot temperature and is waterproof and stain-resistant? Our 10mm coroplast sign is the perfect option. They’re great for marketing a business, promoting a political campaign, used as for sale sign and other outdoor uses. These super thick signs are printed full color and are available in a large selection of sizes including our popular 18”x24” size. You have the options to incorporate grommets or H-stakes enabling you to display them in hight traffic areas easily. 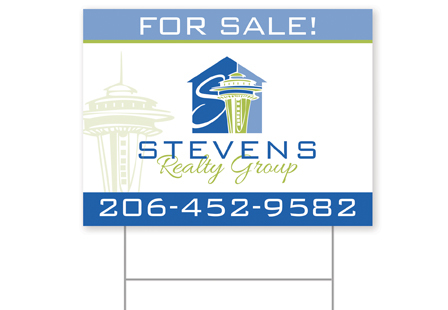 Our custom yard signs are sure to grab attention. Options include metal H-stakes or grommets allowing you to display them easily in high traffic areas. Substrate: 10mm Heavy Duty Coroplast®, extruded twin-wall polypropylene board. Printing: 4-color process printing (CMYK), single or double sided. Once printed, this product may show a linear effect due to its' corrugated flute structure. Ink is UV Cured. Bleed Requirement: Please include 1/2” (0.5”) bleed on of your artwork, do not add crop marks. Please Select 12" x 18" 18" x 24" 24" x 24" 24" x 36"